The Hubble Space Telescope has been sidelined by a serious pointing problem. NASA announced Monday that one of Hubble's gyroscopes failed last Friday. While that was expected—that particular gyro was expected to go sometime this year—the surprise came when a backup did not kick in properly Saturday. Gyroscopes are needed to keep the 340-mile-high (540-kilometer-high) Hubble pointed in the right direction during observations. Precise pointing is crucial: Astronomers use the telescope to peer deep into the cosmos, revealing faraway solar systems as well as galaxies and black holes. Just last week, astronomers said they may have discovered the first moon outside our solar system, with Hubble's help. 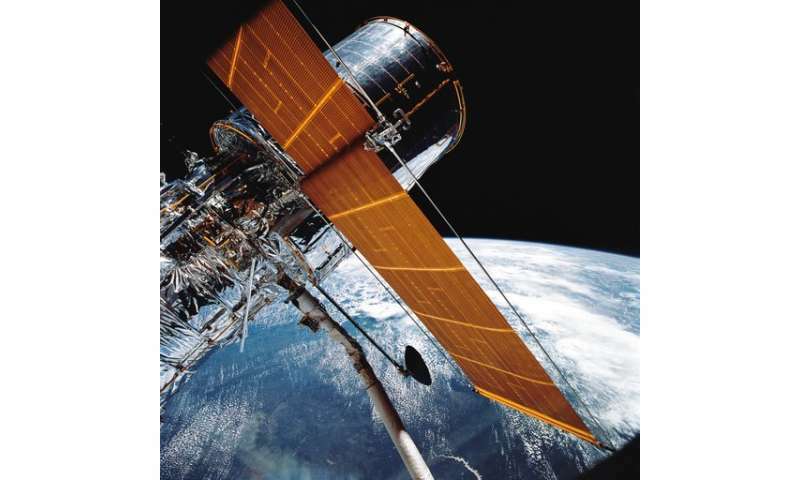 Two of Hubble's gyroscopes are working fine, Sembach said. The last one was in reserve; it was turned off some years ago after exhibiting some "funny behavior" even though it was getting the job done, he said. That's the one that flight controllers turned on Saturday as a backup; as of Monday, it still wasn't working as expected. Anyway, Hang in there Hubble! Maybe BFR will be able to do a servicing mission as one of its early missions? That should be within its capabilities? Is the failure of a gyroscope known as Gimble Lock? Why can't we make longer lived gyroscopes? Apparently this problem is going to go away as we move to ceramic bearings. Replace the chemical thrusters with electric plasma ones, and use an electronic gyro. Not the end of the world by any stretch of the imagination, NASA has two more space telescopes as big as Hubble in warehouses, that were transferred from US Military Intelligence services to NASA six years ago. They were never deployed, and advances in satellite surveillance technology rendered them militarily obsolete. "The fact that we're having some gyro problems, that's kind of a long tradition with the observatory." Maybe it's time to break with "tradition" and get new design and manufacturing contractors. Hubble ST is worn out and obsolescent. What is the moment that the pointing gyroscopes must transfer, that you would have load a 'bearing'? A long time ago it was my job in particular ship's casualties to hold 'up' a 55 lbm 35K RPM mechanical gyroscope. The training videos of failed bearings were impressive - bomb like. They did the set that was installed in 2009 was a different design. That these gyroscopes have worked as long as they have is a minor miracle. Nearly 10 years of constant work under those conditions without a minute of servicing - you'll be hard pressed to find something that can do that down here, let alone in space. Only one of the two telescopes "donated" from the NRO currently has a mission, that's WFIRST infrared astronomy mission (slated for 2024 because of the tiny trickle of funding). The thundering herd of lawyers in Congress won't give them any funding for the second one. Hubble doesn't use thrusters, for a few reasons- contamination of optical surfaces and limited reactant being the two main ones. Instead of thrusters, Hubble uses reaction wheels and magnatorquers for positioning. Didn't that custom include.....SERVICING......the single most productive scientific instrument in history? Its the mass and inertia of the gyroscope that keeps the Hubble pointed in the same direction. Electronics doesn't help you there. Plasma thrusters may have some advantage but even they have a finite fuel source. Its the mass and inertia of the gyroscope that keeps the Hubble pointed in the same direction.